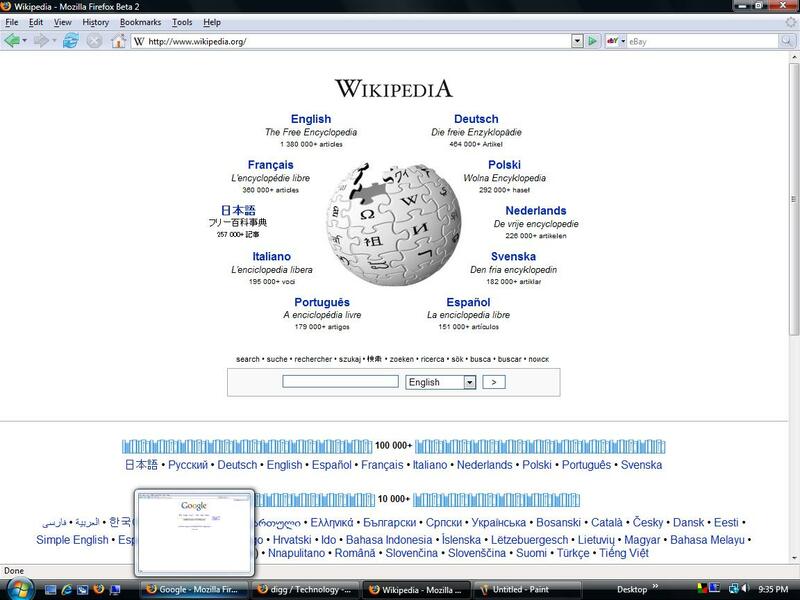 I'm typing this message right now on a computer running Windows Vista RC1 and I'm using the Firefox 2.0 Beta web browser. Let me start of by warning you that these are beta versions of software and I am not in any way recommending that you install them on your machines. I have installed both on a spare computer I have, with nothing important or personal on the hard drive. I wanted to provide my first impressions on both of these betas, along with some screen shots. Hopefully they will fix this prior to release. 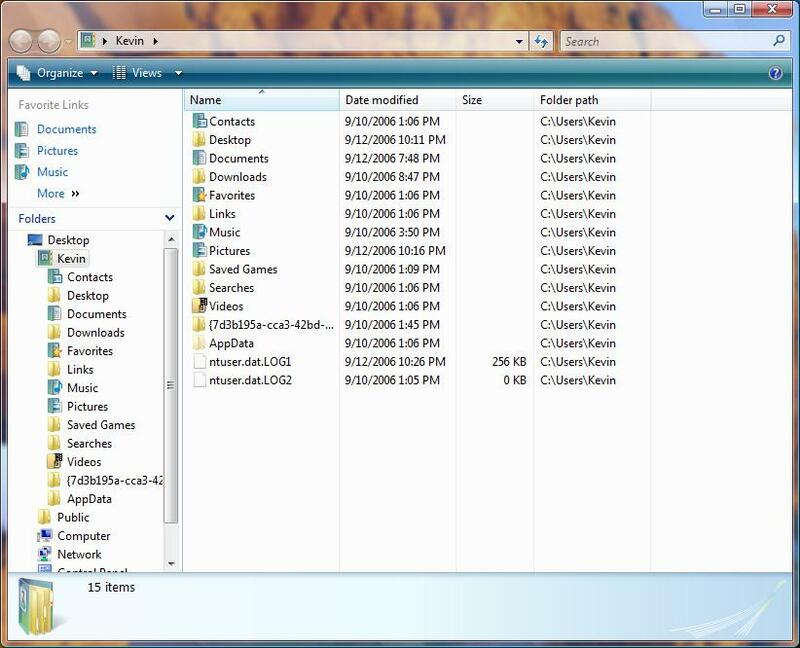 While I was doing this on the Vista computer I went to my other computer and downloaded a beta version of the driver for my sound adapter that was supposed to work in Vista from my motherboard manufacturer's web site. 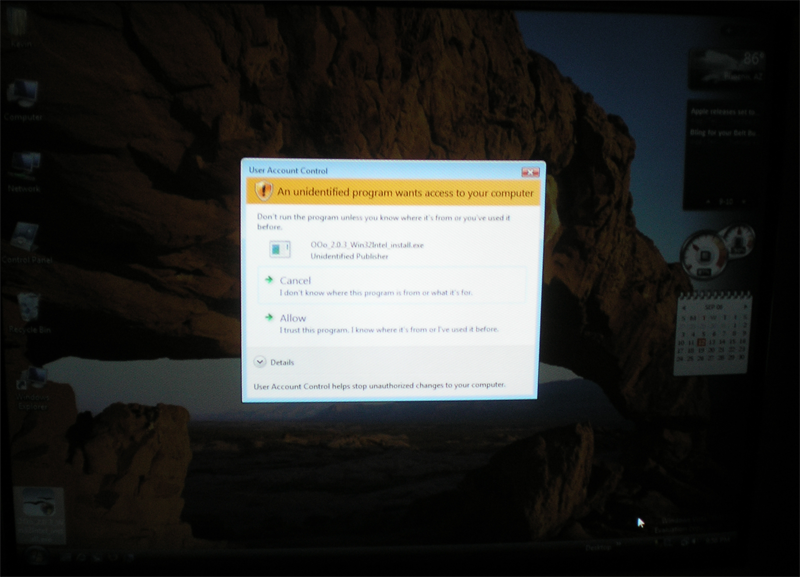 Once the computer restarted, Windows detected the sound card and proceeded to install the driver for it. I thought to myself, "cool, I guess it found the right driver this time." But, I was wrong. The second I tried to play an mp3, I was greeted with a blue screen again. Fun times! I was able to fix the problem by using the system restore feature in safe mode and then I installed the beta driver and everything has worked fine since. It's very pretty. 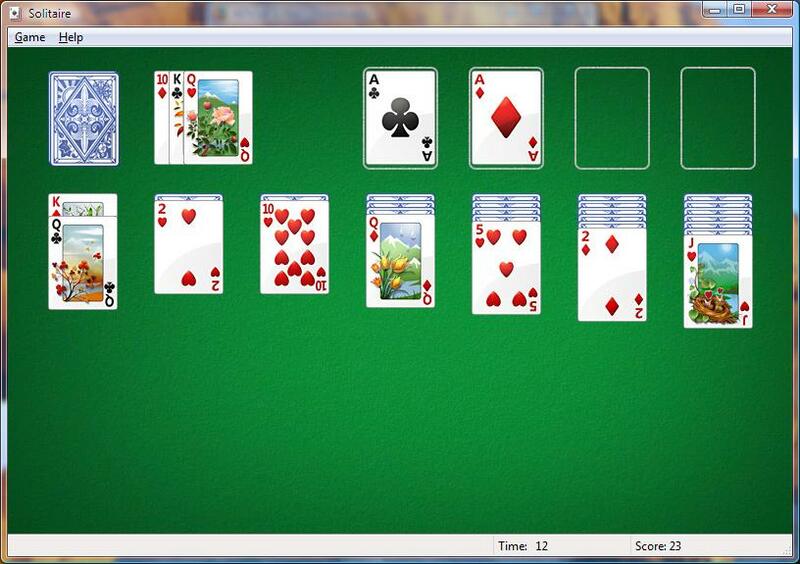 Microsoft has done a good job of polishing the look and feel of the user interface and I like it. Here is a screenshot of the "glass" look of the windows. You have a few options of what you can put in here, but it's pretty limited right now. You can see that I have a weather gadget, a calendar, and the other one is an RSS feed that I have linked to Digg. I imagine that there will be a lot of 3rd party support for the gadget bar and we'll probably see some pretty cool stuff for it. Here's what you get when you explore the computer, take a look and see if you can notice anything familiar missing"
If you didn't notice, the menu bar is gone. 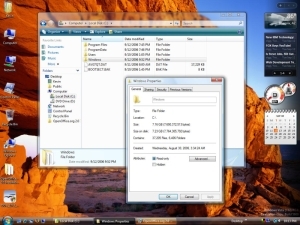 All of Windows Explorer is like this now. No more "File", "Edit", "View", etc. This was very awkward when I wanted to set all my windows to default to details view (which seems buggy and inconsistent). This may prove to be better in the long run, I really don't know, but right now it's confusing. This seems like a nice feature, and Linux has a similar security feature. However, I don't like that you just have to click a button. In Linux, you have to enter an administrator-level password. I'm not sure exactly what Microsoft is doing when they pop this window up, but I imagine it probably wouldn't be too difficult to script a piece of spyware to automatically "click" the button. Whew! That was a lot about Vista. I'll keep you guys up to date on my experiences. I really like the look, but I don't see paying $100+ ($259 for an upgrade to Ultimate) for a new coat of paint with potentially rusted metal underneath. I would also recommend that if you are considering on upgrading to Vista, either install it on a non-important machine or wait 6 months to a year while the work out any bugs and security issues. I'll keep this short. I installed the beta of Firefox 2 and it's working great. For the most part, it looks the same as the current version of Firefox so I won't post any screenshots. It has two new features that I am finding most useful. The first is built-in spell check. So when I'm typing on message boards, or here on my blog, all my typos are underlined in red. I used to paste my text into Word after I typed it up to catch any mistakes, but this is much easier and quicker. The other awesome feature is the ability to "recover" from a crash. If Firefox crashes for any reason, when you start it back up it gives you the option of restoring your session. If you click yes, all your windows open back up on the pages you were on. It's very handy. That's all I have for now (I expect it's more than enough). If you are reading this, thanks for sticking with me during this very lengthy post. And if you have any questions, feel free to comment on this message. Oh, and there's a poll at the bottom of the page if you haven't answered it yet: click here for a shortcut. I'm typing this message right now on a computer running Windows Vista RC1 and I'm using the Firefox 2.0 Beta web browser. Let me start of by warning you that these are beta versions of software and I am not in any way recommending that you install them on your machines. I have installed both on a spare computer I have, with nothing important or personal on the hard drive. I wanted to provide my first impressions on both of these betas, along with some screen shots. 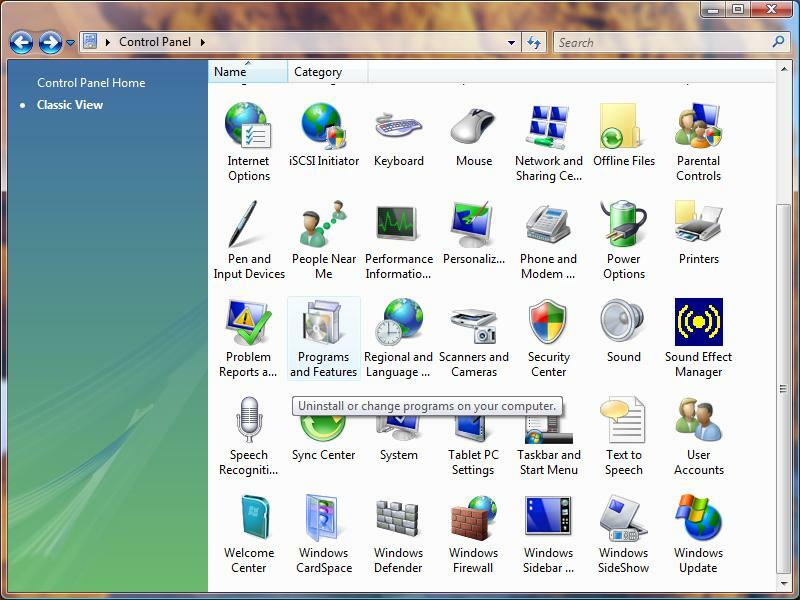 Windows Vista: I installed Windows Vista on my spare computer because I provide technical support both professionally and to my family. I want to become familiar with the ins and outs of the operating system before I start fielding questions about how to change the desktop, add and remove programs, etc. So lets get into it... Installation: I downloaded the software off of Microsoft's web site and burned it to a DVD (the image was about 2.6GB). I then rebooted with the DVD in the drive and performed an install on a brand new 20GB hard drive. At the time I downloaded and installed the software Microsoft wasn't releasing new keys for the software, but I was able to install without entering a key and was told that I had 14 days to provide a key. I have since obtained a key and Microsoft is giving them out to everyone who requests one at this point as far as I am aware. During this particular installation it asks you what version of Windows Vista you want to install. I choose the "Ultimate" version (that's really what they call it) because I wanted to make sure I could play around with all the advanced features for future reference. The install went flawlessly and required much less hand-holding than XP does. 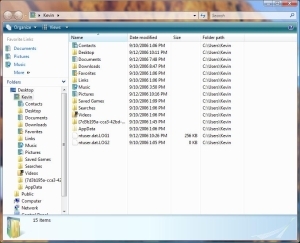 Once my computer had rebooted I was running Vista, and the only hardware it hadn't installed was the game port and sound device on my motherboard. I put the driver disk that came with my motherboard in the drive and attempted to install the driver. I was given a warning that the driver was not digitally signed (most drivers aren't), and, like always, I clicked through this message and installed the driver. Windows told me I had to reboot so I did so and when it restarted I heard the new Vista start up sound... Followed by the infamous Blue Screen of Death. 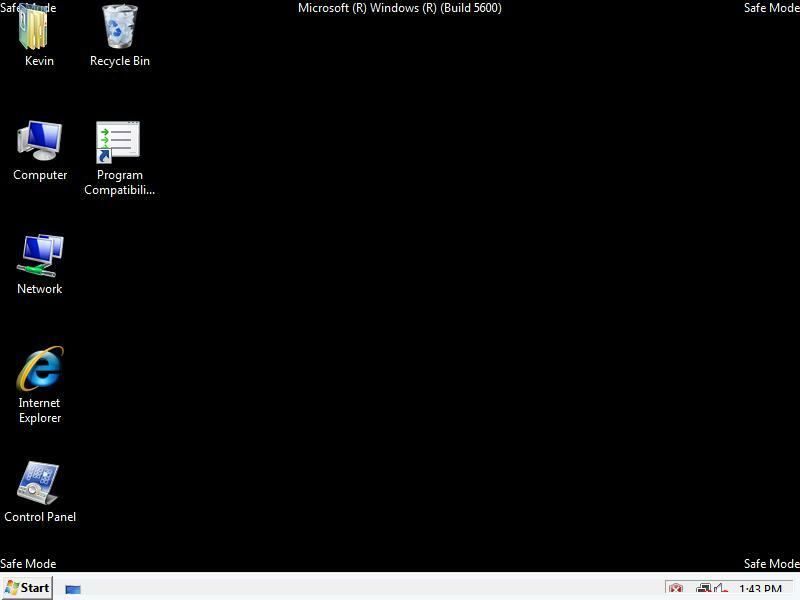 Well, this is to be expected when you are working with beta software, so I restarted the computer in safe mode and un-installed the sound card from windows. At this point I noticed that there appeared to be an issue with text and icons on the task bar in safe mode: Hopefully they will fix this prior to release. 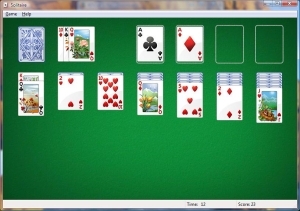 While I was doing this on the Vista computer I went to my other computer and downloaded a beta version of the driver for my sound adapter that was supposed to work in Vista from my motherboard manufacturer's web site. Once the computer restarted, Windows detected the sound card and proceeded to install the driver for it. I thought to myself, "cool, I guess it found the right driver this time." But, I was wrong. The second I tried to play an mp3, I was greeted with a blue screen again. Fun times! I was able to fix the problem by using the system restore feature in safe mode and then I installed the beta driver and everything has worked fine since. First Impressions of Vista: It's very pretty. Microsoft has done a good job of polishing the look and feel of the user interface and I like it. 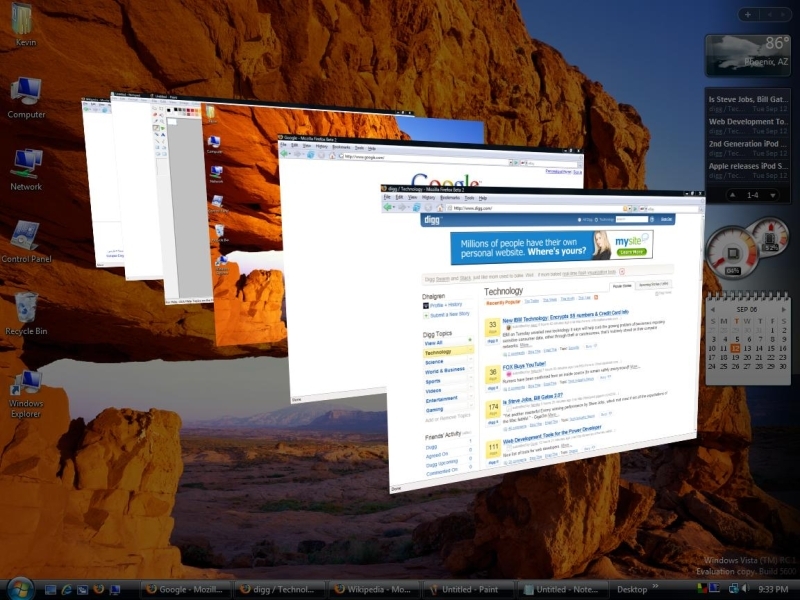 Here is a screenshot of the "glass" look of the windows. Enormous Version If you can't see, the Windows directory is 7.16GB! 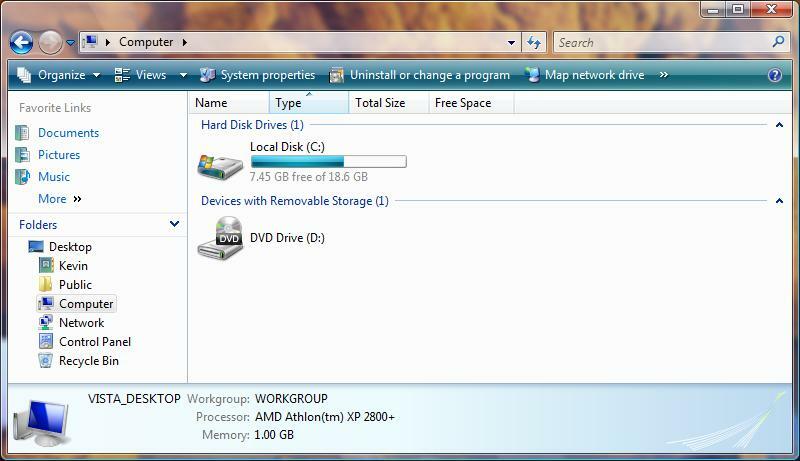 In comparison, Windows XP Professional takes up a little over 2GB of space. Vista needs over 3 times as much hard drive space. I guess it's a good thing that DVD drives are cheap these days because it looks like you're going to need one to install Vista. Either that or it's disk-swapping time... At one point I wanted to remove a program I had installed, and there was no uninstall option for the program in the start menu. I opened up the control panel and the "Add/Remove Programs" option was conspicuously missing. 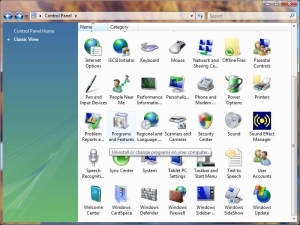 It took some searching but I finally found the "Programs and Features" icon. Why they changed this I don't know. It seems a little silly to confuse us long-time Windows users like that. Here's a screenshot of it: Here's what you get when you explore the computer, take a look and see if you can notice anything familiar missing" If you didn't notice, the menu bar is gone. All of Windows Explorer is like this now. No more "File", "Edit", "View", etc. This was very awkward when I wanted to set all my windows to default to details view (which seems buggy and inconsistent). This may prove to be better in the long run, I really don't know, but right now it's confusing. 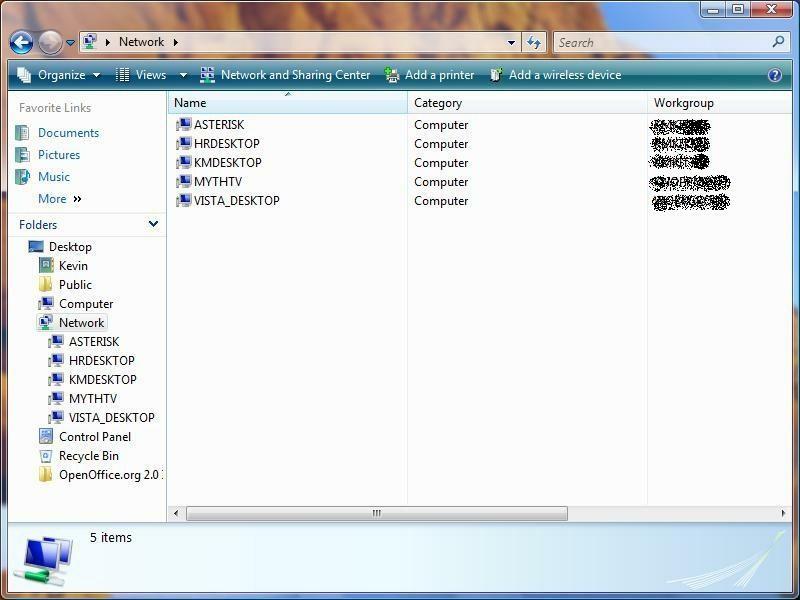 I was impressed with how it found all the computers and servers on my network (I covered my workgroups): You may also have noticed through all of this that they got rid of the "My" in front of everything. There is no longer a "My Computer", "My Documents", "My Whatever" and so on. The computer is just "Computer" and your documents are in a folder by the same name as your username (this reminds me a lot of the Linux home directory): It appears they've attempted to improve functionality, but so far it seems like a half-assed attempt to me. Again, this is a first impression, but should I have to hunt down at least one obvious functionality improvement? It really just seems like bells and whistles, spit and polish (light on the spit). So what other new features is Microsoft touting? 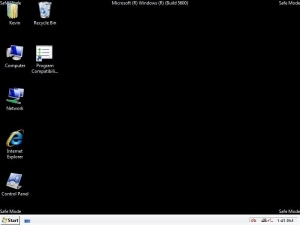 Oh yeah, the "most secure version of Windows ever!" [sic] Security: Microsoft definitely learned a lot from their last "Most secure OS ever," Windows XP. If you don't know, when XP was released it was actually the least secure version of Windows ever. 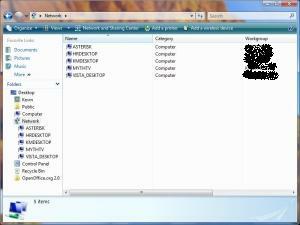 However, Vista comes bundled with a firewall, anti-spyware (Windows Defender), but no anti-virus software. They also now require you to "authorize" programs installing or changing system settings. Any programs with this shield icon: will require authorization to install. When you double click on the icon the screen fades and an authorization window pops up (I took this with a digital camera because I couldn't get a screenshot): This seems like a nice feature, and Linux has a similar security feature. However, I don't like that you just have to click a button. In Linux, you have to enter an administrator-level password. I'm not sure exactly what Microsoft is doing when they pop this window up, but I imagine it probably wouldn't be too difficult to script a piece of spyware to automatically "click" the button. Whew! That was a lot about Vista. I'll keep you guys up to date on my experiences. I really like the look, but I don't see paying $100+ ($259 for an upgrade to Ultimate) for a new coat of paint with potentially rusted metal underneath. I would also recommend that if you are considering on upgrading to Vista, either install it on a non-important machine or wait 6 months to a year while the work out any bugs and security issues. On to FIREFOX 2... Firefox 2 Beta: I'll keep this short. I installed the beta of Firefox 2 and it's working great. For the most part, it looks the same as the current version of Firefox so I won't post any screenshots. It has two new features that I am finding most useful. The first is built-in spell check. So when I'm typing on message boards, or here on my blog, all my typos are underlined in red. I used to paste my text into Word after I typed it up to catch any mistakes, but this is much easier and quicker. The other awesome feature is the ability to "recover" from a crash. If Firefox crashes for any reason, when you start it back up it gives you the option of restoring your session. If you click yes, all your windows open back up on the pages you were on. It's very handy. That's all I have for now (I expect it's more than enough). If you are reading this, thanks for sticking with me during this very lengthy post. And if you have any questions, feel free to comment on this message. Oh, and there's a poll at the bottom of the page if you haven't answered it yet: click here for a shortcut.